do any of you bro's even lift????? Re: do any of you bro's even lift????? Some people only advocate parallel, and getting your arms parallel with the floor does stop the bar somewhere around the head area (not all the way down to chest). I go to chest personally but there's no reason to judge others? Also, as you age, injuries will dictate what you can and can't do. I'm pretty sure I stopped deadlifting for good last year after I got tired of another back tweak. I also don't do skullcrushers because they flare up my right elbow. I can't take sets of leg press past 360 or my right knee will build up fluid, to the point where I can't bend my leg more than 45 degrees for 3-5 days. Bottom line, once you're in middle age you definitely have nagging areas if you trained most of your life or ever played sports. You learn to lift in a way that allows you to be pain free for your body. Judging others isn't your job. One thing we should all try to do is help other and others out. As jonebone pointed out, people may have limitations as to why they can't execute a full ROM. Are you there to lift for them, or yourself? That's the question you should be asking. Anecdote some might find interesting. According to my logs I've only benched 15 times in the past 6 months and have benched zero times in the past eight weeks along with zero other direct chest work. My bench setup at work is garbage so I just gave it up for a bit and decided to focus more on my squat and weightlifting accessories. My only heavy upper body work is OHP and push press/jerk variants along with shoulder prehab work and some occasional bro bi/tricep supersets I'll throw in at the end of some workouts. Got home from being at sea these past 8 weeks, got under the bar, and hit within 5 lbs of my bench PR. Hell it makes me think my bench might have even gone up considering my nervous system is dead cold when it comes to heavy benching. A few weeks back under the bar and getting a feel for heavier (well for me at least lol) bench weights again and I can't see myself not getting my original PR if not a tad more. So yeah dropping something to focus on something else isn't the end of the world and your gains probably aren't going to evaporate overnight. Hit a 280lbs front squat today. European weightlifting championships are going on this week. Stumbled across one of England's lifters and thought I'd share for technique and glute activation tips. I started doing front squats about 2 months ago. I really enjoy them and am starting to see definition in my thighs. My front squat weight is pathetic though. I'm in the camp that for the average Joe's health and fitness that the front squat is probably superior to the back squat. It's easier to do safer (more upright, less spinal sheer load as you can't good morning a front squat) and the front rack position you're required to hold to keep from dumping the bar forward requires working pretty much all of the upper back muscles required for good posture that we all screw up by sitting at a desk. It also has the bonus that it never requires a spot at all. Chick above is a cutie. I probably follow too many female Instagram lifters. haha. There are so many strong women now-a-days. I haven't updated in awhile. I've stepped away from low bar squatting for the moment because i'm still getting severe low back tightness afterward. Been working on a lot of mobility to help with tightness. So instead of focusing on what i can't do i focus on what i can do and that is 2" (2x4 board underneath heel) high bar squatting. No low back pain at all. Been hitting a lot of volume too. Today i did 225X10, 225X10 225X20 My quads were going to pop! I'll also perform Bulgarian split squats later in the week to target glutes / hammy. Switched up bench routine recently. No real purpose. Just something different. I'll floor press on day 1 and bench press on day 2. Overloading is easier with floor press. Especially when you lift alone. Still performing the movement twice a week. Still OHPing and DLing too. Gotta keep the lifting staples. 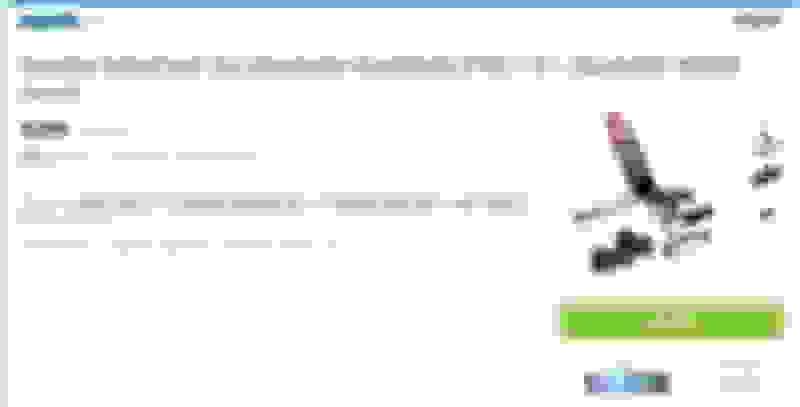 Also, not running a program right now. First time in 5-6 years. I felt somewhat lost at first but i tell ya what...it has been kinda nice here lately. Just lifting. Not sure how long it will last though. ha! I need to do these but I never do. So what Lasha has been doing in the training hall at Europeans is incredible. 550lb clean and jerk. He also did 540lbs for three singles (for reference 540lb is what the silver medalist at the last world championship hit). The absolute world record which has stood for 30 years is 585 lbs. 462lb ******. Absolute record which he holds is 484 lbs. He made those lifts look way too easy. The Europeans are also in his home country so everyone is hoping he goes ***** out. He can win gold without even trying so there is no reason to really push it if he is eyeing the Olympics, and that would probably be the smart thing to do honestly, but we're all hoping he's not feeling smart this week lol. Has anyone ever tried the 210 Rep challenge? Pick a lift, preferrably a compound like bench or squat, and do 20 sets of increasing reps starting at 1 and ending at 20, using the same weight. I did it on bench yesterday just for fun and it was hellish for those last few sets. I used my timer and did it in approximately 35 minutes using 50% of my 1RM. The DOMS is torturous by the way but it was really fun! I suppose one could do it that way if they felt like it, but i didnt do it. So you just did 20 reps? or you kept repeating the previous reps? Start with 1 set of 1 rep, next set is 1 set of 1 and 1 set of 2, next is 1 of 1, 1 of 2, then 1 of 3? I'm looking to cancel my gym membership ($60/month for wife and I) due to lack of time. It has been several months so it is just a waste right now. Looking to buy a simple weight set (bench and dumbells(s)). Saw this pop up on SlickDeals the other day. I know I know, it isn't the best thing in the world, but I have limited space and these adjustable dumbells will work. Individual ones are also price at $1-2 per pound at least in my area and I just don't have the room. My challenge here is that this set only goes to 52.5lbs and I need more (at least up to 70-80lbs each). The BowFlex 1090 set goes to 90lbs but it is also $598 just for the dumbells. Any ideas on a good set out there? This will allow me to do almost all chest exercises, curls, shoulder presses/flys, etc which is good for now. I can run/do pullsups/cycle/walk outside. BTW this set is about $50-100 off normal price. 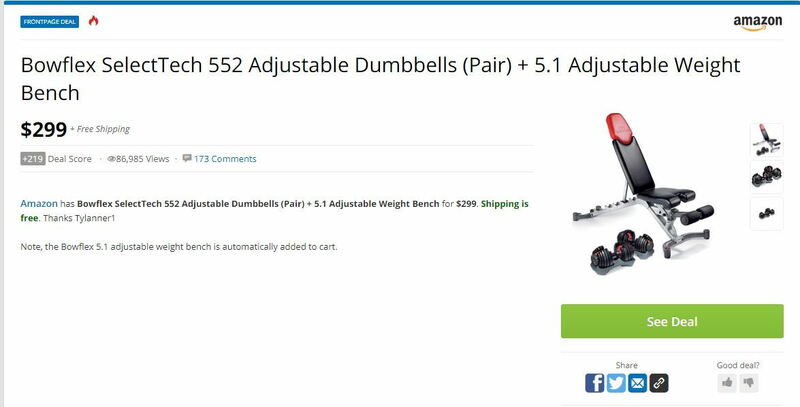 Bench is usually $100-150 and dumbells are usually $300 so you're essentially getting the bench for free. Agreed. But I would not be able to forgive myself if I totally stopped working out. I don't want to spend a ton of money, but a $300-400 investment once will be okay. I'll check the marketplace/CL/etc and see what I find. The one I linked above goes to a 52.5lb weight on each dumbwell. Agree that anything less would be useless. Is it possible to get a 2 day/week membership? Some gyms offer this for folks who don't make it in daily or whatever. Barring that, Craigslist, OfferUp; those sorts of sites will take your money alot further than buying new. Or garage sales. ****, ive found a free cable tower before because someone didnt want to deal with the hassle of borrowing a pickup truck to move it to the dumpster. I'm going to look online. My challenge is I can't have anything big. While I have seen full dumbell/stand sets for $100 I simply don't have the space. I don't believe my gym (LA Fitness) has that sort of option. IMO unless you are going at least 3 times a week, it doesn't even do anything. I also need to find a gym that's close since being away at work 13-14 hours a day makes me not want to leave the house when I get home. I need something very close. Anything more than 5 minutes away I'm not going to. LA Fitness is 1-2 minutes away. I was in the same predicament. The best advice is just try to make time. I haven't been going to the gym because I got a new puppy and it's tough in the mornings, but I was the same way. Definitely didn't want to go to the gym after work. Have you tried waking up earlier and going in the AM? way less people, more focused imo, and a great start to the day. Going once a week is still better than going no times a week. Especially if you work at a desk job, that one or two days of physical activity will for sure make a difference overall. If you absolutely can't make it to the gym at all, then what others said. (letgo, clist, fb marketplace etc) will be better than buying new. Look for estate sales near your area. Especially in CA, I'm sure you're bound to find a good set up for gym. Barbell bench set up would be the cheapest thing to find. I've found those frequently at estate/garage sales for <100. You can buy dumbbells at Dicks/any sports store for cheap. You would just need, pull up bar, and spend another 100 or so on dip machine. You could basically work all your muscles with just that setup. Ugh, I wish. I wake up at 5:30am right now and it hurts. There's no way I can get up earlier. I get home about 6-7pm at which point I still have to eat/prepare food. If I go to the gym, I either eat very late or go to the gym very late. The latter means I don't sleep well. Before I was married, I'd go religiously because I could. But since I have obligations at home, I have to make sure the schedule works for both of us. My wife visits her parents 2-3 times a week and so do I. Both sets of parents have health issues so we can't really avoid this. And I don't have room for individual ones. Quick Reply: do any of you bro's even lift???? ?